There was a day when people talked. Today when you pass a stranger on the sidewalk, there are no conversations about life, no regard for each other's experiential wisdom (what that person has been through in life and what he's learned from it), and no social permission to breach a discussion about issues of love, or God, or... anything, really. In fact, today you're lucky to get a silent head nod and not fear for your life when walking past a stranger. But there was a time when philosophy (the love of knowledge/wisdom/truth) was considered the most important pursuit in a man's existence. And so it was normal, if not expected, to run into a stranger on the street and engage him in conversation about, for example, the nature of the human soul. Many families cling to a "Christian-only" policy when it comes to books, movies, and music. And while I encourage protecting the minds of young kids, it's sad to me that Christians are growing up to adulthood with a subconscious belief that everything "secular" is bad. These kids grow up to be critical (rather than discerning) of everything that doesn't have a Christian label attached. I would submit that God can use "secular" art (literature, theater, music, etc.) to accomplish His evangelistic purposes in our world today, just as He did through ancient paganism in the centuries before Christ's first advent. In ancient Greece, they didn't have an AMC, Barnes and Noble, or Flava' Flave (it wasn't all bad in ancient Greece); what they had was the theater. The theater wasn't just another source of mind-numbing over-stimulation like much (not all) of our entertainment is today; the theater was where deep-rooted issues of politics, war, and the human condition were expressed artistically through comic, tragic, lyric, or epic portrayals. The things performed on that stage were THE stories and, in many cases, the beliefs of that culture. One such play was called "Prometheus Bound." The tragedy opens with Prometheus, a Titan god who created man and posesses the gift of prophecy, nailed to a rock on a mountain. The play unfolds as Prometheus recounts the events leading up to his punishment: Cronos, the god of the Titans, and Zeus, the god of the Olympians, were at war with one another. Prometheus, with his gift of prophecy (his name means "Forethinker") tried to counsel Cronos in his strategy against Zeus, but Cronos would not listen. So, in order to save himself and his family, the god Prometheus defected to the Olympians, and by his counsel, Zeus defeated Cronos. But then Zeus punished Prometheus by making plans to destroy all of mankind (Zeus wants to punish him because, like all tyrants, he distrusts even his closest friends for fear of his power being taken from him). 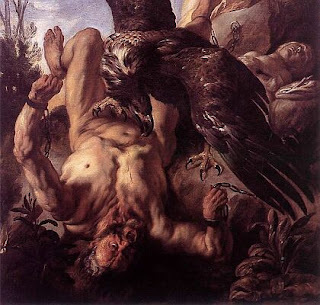 Knowing that Prometheus is compassionate to the race of men (since he created them), Zeus hides the gift of fire from mankind, leaving them utterly incapable of performing their skills/crafts of survival, which would lead to their complete destruction. But Prometheus, the god, takes on human flesh and sacrifices his life in order to save and to bring light (fire) to the race of men. As a consequence, Zeus has Prometheus nailed to a rock on a mountain, where vultures will peck out his eyes every day forever. This story (and many other Greek plays) would have been common and extremely well-known by everybody in that time (perhaps like you and I know the story of Cinderella). So when Paul comes to Greece with the Gospel ("good news") that there was a God who left His throne in heaven to take on human flesh, in order to be the "light of the world" and save men from the curse of death by Himself being nailed to a tree on a mountain... he was speaking their language, to say the least. Did God take a pagan play about a polytheistic war and a god-man's sacrifice and use it as an evangelistic foundation for Paul to build upon? Could God have inspired those stories in the hearts of Greek men in order to prepare them for the coming of Christ? Does God commonly use "secular" expressions to make His work known to generations of people today, as it seems He did in ancient times? I would submit that yes, He can and He does. Perhaps we should be less guarded as a "Christian" culture and more confidently aware of what God is working in the hearts of "secular" beings that could be foundational to our witness. Please POST your thoughts (don't keep them to yourself); the whole point of this series is for you to contribute to the conversation. And after you've commented, please check out the above-mentioned friends' blogs for their responses (Pray Your Gods and Late Night Over Pancakes). Good stuff Ryan. I'll have a response for you probably by the end of the week, whenever I can steal some more time. I hope all is well back East. Talk to you soon gangsta'. Can God use “secular” art for evangelistic purposes? The first point to ponder is the “Can God…” part. In my opinion, it seems clear in Scripture that God can do whatever He wants. When God is capable of providing a path through the Red Sea for people to walk across, swallowing one of His people with a huge fish and taking him back to where He intended him to go, healing countless numbers of people from life long ailments, and raising dead people back to life (just to name a few examples), I would argue that He is capable of using secular material to save those that are still dead to Him. Second, as Christians, to what degree should we seek out this secular art to simply be informed about it in order to relate to someone that is lost? I think we need to be careful in what we expose ourselves to. I’m not in the camp of only and all “Christian” label material, but I do think we are to guard our minds. An example of secular art that everyone knows about is the Harry Potter series of books. Think about it. Nearly every child, from age 6 to 16, in the world (I don’t think that is an exaggeration) is aware of, and has probably read at least one of the Harry Potter books. Not to mention how many adults have read all the books (my wife included). The “Christian” community went ballistic when these books first came out stating that they were promoting witchcraft. After having read the first two books, I would say that they are simply fantasy children’s books. There is no agenda pushing for a growth in the witchcraft society. They teach good moral lessons through a boy who happens to be a wizard. But, do we have to read these books to draw correlations to the Bible and better witness to some unsaved Harry Potter fan? I don’t think so. If the “Can God…” argument above is true, then God can just as easily use someone that is not informed about Harry Potter to witness to that Harry Potter fan if He desires. Pilgrim’s Progress, by John Bunyan, is about Christian (the pilgrim) traveling the King’s path to the Celestial City. Along the way there are many distractions off the path, some that hinder Christian and some that he wisely avoids. In the book there is only one path to the King, and I believe we have the same path to tread toward our King. We must be careful not to be ensnared by the “secular” world and the things that it offers. Not that we close our eyes and pretend that they don’t exist, but we are to be discerning. Perhaps that’s your point Ryan B. For me, I am too weak to overcome some of the worldly temptations much of the time, and I don’t want to be exposed to things that are secular and contain sinful acts, words, thoughts, etc… just for the sake of being informed. I need my mind to be filled with Christ like things in order to have the right perspective in my daily trials. Granted, I would like to have a wand and turn people into toads from time to time. Thank you for your comments. I don't know who you are, but I appreciate you for the time and thought you invested in the discussion. It's understood that God can accomplish anything through anybody (or nobody), no matter how informed or ignorant His servants may be. All I'm saying is I'd rather be an informed Christian than an ignorant one. The Bible calls us to be "in" the world but not "of" it. But there are Christians who spend more time and energy keeping themselves "not of" the world than they invest actually being "in" it- and for that, I'm willing to boldly say, we miss opportunities to witness, yes. That doesn't mean God can't make a rock do my job, it just means that God has sent YOU and ME to be light to this darkness, not a lamp hidden under a bowl. No one is suggesting life without fences, wisdom, or discernment- if anything, those are the primary things I was encouraging in my post. The problem comes when our "discernment" is less motivated by wisdom and more motivated by fear. In my observations (and I've had a lot of extremely conservative friends over the years), many Christian's "discernment" looks an awful lot like fear of being swayed by the world. They put up so many protective fences that they eventually become other-worldly, sterile and dull people (at least to the eyes of the "secular" world). And while we're called to be "a peculiar people," we accomplish that by being salt and light to a dark and tasteless world, NOT by removing ourselves completely from it. Finally, to use your example, let's assume for a minute you have a neighbor that's a huge Harry Potter fan. It's not a question of "can" God use someone uniformed about Harry Potter to witness to him; of course He can. But I will just as confidently assert that if you were given the choice between sending a believing Harry Potter fan as a witness or sending a completely uninformed "Harry who?" as a witness... wouldn't you choose to send someone who can speak their language? There are stories of redemption, grace, love, and faith all around us in our culture's movies, music, and art. We would be wise to start connecting the dots of their stories to the story of Christ's redemption, rather than positioning ourselves at odds with them by refusing to participate in their culture. "Though I am free and belong to no man, I make myself a slave to everyone, to win as many as possible. To the Jews I became like a Jew, to win the Jews. To those under the law I became like one under the law (though I myself am not under the law), so as to win those under the law. To those not having the law I became like one not having the law (though I am not free from God's law but am under Christ's law), so as to win those not having the law. To the weak I became weak, to win the weak. I have become all things to all men so that by all possible means I might save some. I do all this for the sake of the gospel, that I may share in its blessings." I would submit that there is, biblically speaking, no such thing as christian music, movies, books, etc...these mediums do not contain souls and cannot accept christ as savior. therefore they are not christian. why is this an important distinction? b/c the moment we begin grouping something like music into a christian category, we decieve ourselves. case in point. if you walk into your local "christian" bookstore you will find that the best selling christian books contain really no gospel at all. they are filled with gobledy gook that sounds christian but is really no gospel at all. on the other hand, i can pop in the latest teen angst album and hear about depravity and hopelessness in relationships, work, life, etc. now that's the gospel......but it's not complete. what then is the job of the church? it is to complete the story. we validate art, yes secular art, but we renew the art by showing how the gospel completes/re-tells the story that is being told,sung,drawn,etc. b/c we were all created to worship God but the problem is that man suppresses the truth of God. if we truly believe romans one then all art is screaming for god...for his truth. the church therefore can, with confidence, 1) validate the truth presented in the art...b/c romans 1 tells us it is there...somewhere....and 2) use the message of the gospel to complete/re-tell/renew our culture and our arts. those are my stream of consciousness ramblings for now....i don't have my own blog. i'm still cool though. i do have one of those email addresses. you can find me at brad@citychurchftl.com. thanks for the needed break from studying for my greek final....if i fail tonight, i'm coming after you brasington. Ryan, I agree that we should be informed Christians in our approach to those that are lost. My concern is how much do we expose ourselves to in order to be informed. I don't think that Paul participated in anything sinful just to appear to be like one of the Jews or gentiles he was witnessing to. That being said, and assuming you agree, we too have to be cautious about what we view in becoming informed. Philippians 4:8 speaks of keeping the the right things in focus. We do need to relate to those around us in order to have an effective relationship. I do agree that we need to be able to speak the language of those we are witnessing to. However, I don't think we should promote art, music, movies, etc... that contain egregious sinful acts just because it may be popular and we need to relate. Anonymous Brad, good ramblings. I suppose you're right with the "Christian" music. However, I think it's just a label. I'm not sure I buy into the Romans 1 argument. Yes, the real truth is suppressed, but is it speaking about truth in all things both that man has created and God has created? Thanks for letting me continuing in my long winded ways. I'm enjoying the blog. By the way, check out this link to another blog talking along the same lines as your discussion ans specifically the example of Harry Potter. i vote for no more anonymous posting. longwinded... reveal yourself! as for romans 1, my point was in saying that every person is screaming for god. therefore, everything that is created ("art") says something about god. Thanks, Brad for your comments. I agree whole-heartedly that we have a responsibility to "finish the story." Long winded: while I truly appreciate your input, I'm afraid you've muddied the argument by some sort of pre-existing "chip on your shoulder" that you haven't been quite frank with us about. Either that or you’re not listening. What have any of the other commentators said to suggest willfully "engaging in sinful acts," as you quipped? It seems to me that you are quite the stunning example of the very person I intend to make an example of by my initial argument. If your point was simply to state "true, we should be informed, but don’t forsake holiness," then you would have heard all of us agreeing with you and dropped the argument long ago. Instead, it seems that you're still dissatisfied with how we've received your input. So, please tell us quickly what it is that you’re still not agreeing with because I'm beginning to think that you just like to hear yourself talk and have thus been adequately named. Ryan, you are right sir. I do enjoy hearing myself talk. That aside, I was not trying to argue for the sake of arguing, merely trying to be thoughtful in my response. I do agree with the your "true, we should be informed, but don’t forsake holiness,". And since this is your blog I will stop with the long windedness. Sorry if I carried on too long. Brad, I'm practically a big brother to you through your good friend on the West Coast, Danny Boy. I simply have not wanted to put my name on their because you and Ryan have the formal education, and my theology is a bit more off the cuff. James Boyce has an excellent commentary on Romans that I recommend if you haven't read it. Yes! Big bro in the house. Keep the comments coming. I just like knowing who I'm talking to...that's all. I'm all for the banter. Let's have some fun with this thing. I admit, that many times in my attempt to be "relevant"...i indeed cross the line and forget my purpose and mission. it is a line that i will continue to struggle with but i think i'm called to the struggle. the struggle is to be a ballanced christian..to be culturally relevant AND biblically faithful. by the way...ryan is the only one that is educated. he the one that goes to knox. Hahaha! Hugh! Ohhhhh I feel like a jerk. You know I love you, man. I'm sorry; I mistook you for one of those random strangers who just likes to surf blogs and argue about things for the sake of arguing (because I've had a couple of those in the past). And Brad, that's the most ridiculous thing I've heard (Knox): I'm just the music guy, what do I know? You guys crack me the frick up. I've been unable to post for weeks now as I've been loaning out my computer to the lady and waaayyy to busy at work to steal a moment for a response blog. I will hopefully have one up not too long from now. Anywho, good stuff gents. I've gotta' jet (as I am writing this at work), but I look forward to more good dialogue! First of all, let me say clearly that if you sense a genuine conviction not to listen to secular music, for example, obey the Holy Spirit at all costs. Our preaching is worthless if we disobey God to do it. Secondly, as Christians we have a two-fold calling: 1) Love God and 2) Love people. We love God by serving Him with our lives (holiness). Loving PEOPLE means we return to the cave, so to speak; now that we've seen the light of God's glory and salvation, we are called to go back into the darkness of our world in hopes "that we might save some" (I Cor 9:22). I fear that some Christians never return to the world once they've tasted heaven, figuratively speaking. BUT, it was never my intention to imply that God requires us to forsake holiness in order to do this. You don't have to listen to foul music in order to LOVE your hard-rock-loving neighbor. But the original question was (rephrased) "can we find God in secular expressions?" I believe that a pagan hard rock song singing about brokenness and needing rescue is a fundamental human problem (depravity) that we as Christians should not be offended by, but easily identify with and use to convey the Gospel truth. If we did this, then we wouldn't carry ourselves as people who have it all together and who want to preach to "sinners," but as people who know our depravity and know a great Savior.